(iii) written notice is promptly given to any affected former client to enable the former client to ascertain compliance with the provisions of this rule, which shall include a description of the screening procedures employed; and an agreement by the firm to respond promptly to any written inquiries or objections by the former client about the screening procedures. (2) any lawyer remaining in the firm has information protected by Business and Professions Code section 6068, subdivision (e) and rules 1.6 and 1.9(c) that is material to the matter. (c) A prohibition under this rule may be waived by each affected client under the conditions stated in rule 1.7. (d) The imputation of a conflict of interest to lawyers associated in a firm with former or current government lawyers is governed by rule 1.11. According to subdivision (a) of this rule, as set forth above, none of the lawyers associated with a firm shall knowingly represent a client when any one of those lawyers, if practicing alone, would be prohibited from representing that same client according to Rules 1.7 (Conflict of Interest with Current Clients) or 1.9 (Duties to Former Clients). The two stated exceptions to this are: 1) if the prohibition is due to a personal interest on the part of the prohibited lawyer and does not present a serious risk to the other lawyers in the firm representing the client; and 2) if the prohibition is based on Rule 1.9(a) or (b), arising from the prohibited lawyer’s affiliation with a prior firm. Tied to this second exception are three additional conditions: 1) the prohibited lawyer must not have substantially participated in the same or a substantially related matter; 2) the prohibited lawyer is screened from participating in both the matter and the fee associated with the matter; and 3) written notice must be given to any affected former client, allowing that client to ensure the firm’s compliance with this rule. Subd. (b) of this rule specifies that once a lawyer has terminated his or her association with a firm, that firm is not prohibited from representing a person with interests adverse to a client represented by the formerly associated lawyer unless: the matter is the same or strongly related to the matter in which the formerly associated lawyer represented the client, and if any lawyer still with the firm has information that is protected by Bus. & Prof. Code § 6068(e) and Rules 1.6 and 1.9(c) which is material to the matter. Subd. (c) explains that a prohibition under this rule can be waived by the client, according to guidelines spelled out in Rule 1.7. And, as explained in subd. 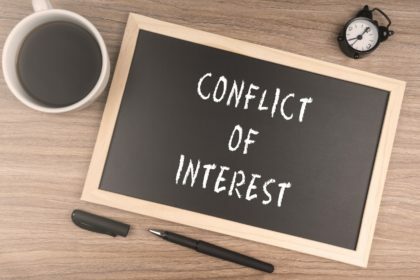 (d), the conflict of interest arising from association with a firm that has former or current government lawyers is covered by Rule 1.11. The American Bar Association (ABA)’s RPC, Rule 1.10(a)-(d) is almost identical to the CBA’s RPC Rule 1.10(a)-(d), including all of the exceptions and conditions associated with the prohibitions. Benefit: Generally speaking, this rule assures clients that both the primary attorneys they previously dealt with appropriately protect their confidences and information, but so do other members of a firm, barring limited, enumerated exceptions.